We meet Saturday mornings during school term. 9:00 am - 12:30 pm. 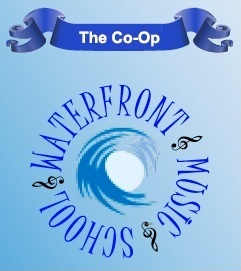 The CO-OP Waterfront Music School relies on its membership fees and donations to continue to provide equipment, music and gratuities for the professional music tutors who run the various music groups. We hold three concerts a year at the end of each school term to help raise funds for ourselves and other charities. We also play carols at Christmas time at various venues to support local charities. We wish to thank the East of England Co-Operative Society for providing the premises for rehearsals. If you would like to become a friend/sponsor of the Music School and receive 2 free tickets per concert, please contact us using the "Contact Us" page.